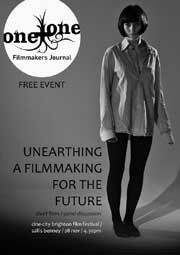 One+One Filmmakers Journal is a Brighton, U.K. based publication that was founded back in May 2009. Issue #5 is about to be launched, so to celebrate the occasion there will be a panel discussion and short film screening at the Cine-City: The Brighton Film Festival on Nov. 28 at 4:30 p.m. at the Sallis Benney Theatre. This is a free and open event. Daniel Fawcett, a filmmaker and the founder of One+One, will participate on the panel and screen clips from Dirt, his second feature film. One of Fawcett’s stated goals is to further remove cinema from its relationship with money. He has committed One+One to being a free publication, available to read both on the web and in print. Also, in the first edition of his journal, Fawcett wrote an editorial announcing his refusal to work in the traditional film industry to fund his own personal films through performing other kinds of work. Greg Scorzo and Lizzie Soden, will screen their short film The Medea Legacy, a controversial film exploring attitudes towards mothers. Vito Maraula, an actor, will screen his first directorial effort, Rosie and Rivette. Ron Peck will screen clips from films over his 30-year directing career, including his seminal 1978 film Nighthawks. One+One is published two to three times a year. All four previous issues are available online to read on the web or to download as PDFs. Some previous articles focus on filmmakers such as Russ Meyer; Kenneth Anger and Harry Smith; John Cassavetes; Peter Whitehead; Jonas Mekas and more. Cine-City: The Brighton Film Festival has already begun and will run until Dec. 5. The fest is screening indie films such as Mark Romanek’s Never Let Me Go starring Carey Mulligan, Keira Knightly and Andrew Garfield; Anton Corbijn’s The American starring George Clooney; Alejandro González Iñárritu’s Biutiful starring Javier Bardem; Rob Epstein’s Howl starring James Franco; Maska, directed by the Brothers Quay and more. Plus, there are other free workshops, a special screening of short films made by local Brighton filmmakers, and a collection of shorts by legendary British experimental filmmaker Len Lye. For more info on Cine-City, please visit the festival’s official website.